Is There A Double Dip Risk In Germany? Well, now we have the detailed German third quarter breakdown, and interesting reading it makes. According to the federal statistics office “economic growth in the third quarter of 2009 was supported by capital formation” – since compared with the previous quarter capital formation was up 1.5% in construction and 0.8% in machinery and equipment. As they also note, however, all this really means is that following the slump in the first quarter of 2009 (â€“18.5% on the fourth quarter of 2008), capital formation in machinery and equipment has now “stabilised at a low level”. In fact, this “support” from capital formation was quite marginal, offering only 0.2 percentage points to growth. While a positive contribution to growth was made by goods exports, which were up 4.9% on the previous quarter, imports also rose , and by more than exports (up by 6.5%), and the resulting trade balance had a negative effect on growth of â€“0.5 percentage points. This was more or less the same as the contribution from household consumption (which was also negative by 0.5 percentage points). But what really, really mattered here – see the chart below – was the inventory build-up which added a staggering 1.5 percentage points to growth., while government final consumption expenditure only increased slightly (+0.1%) over the period and effectively had zero impact on the growth number. So, as I said, it is all about inventories in Q3. And now we need to make an assessment of how much this can unwind in the final quarter, since the current position is very reminiscent of Q1 2008, when the German economy put in a record annualised growth rate (1.7% q-o-q, 7.2% annually) only then to slouch off into recession and four consecutive quarters of GDP contraction. One reason for that surge in GDP, then (as now), was the massive inventory pile-up (see chart for what happened next to GDP), a pile up which was precisely the result of an anticipated continuation in demand – demand which, as it happened, never materialised. Now, the pile up in inventories in Q3 was not so spectacular as the one seen at the start of 2008, nor is the medium term growth outlook so gloomy as it was back then, but there are certain structural similarities in the situation, and these are worth exploring. Basically a build up in inventories may be no bad thing, inventories need to be rebuilt after the massive rundown which followed the failure of Lehman Brothers, and a healthy build-up (and rise in capital investment) would be something we should look forward to. But there are grounds at this point for thinking that things are no so straightforward this time. 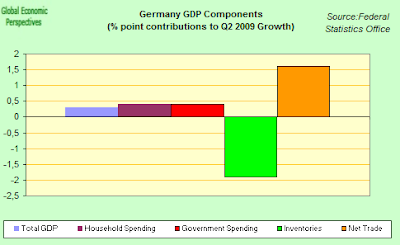 We will now try and take a look at some of the information we have so far on the last quarter of 2009. 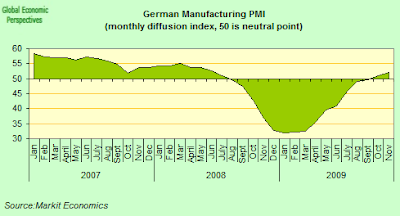 Sources of information here are really of two kinds, the Purchasing Managers Indexes (PMIs) which are based on surveys, but do give us quite a reliable indication of the state of play well before the official data arrives, and sentiment indexes. 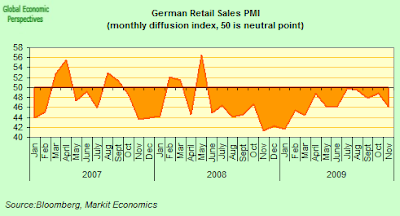 – The Retail PMI was at its lowest level for five months. – Actual sales short of targets by greatest degree for five-and-a-half years. – Retail margins fell at fastest rate since January. 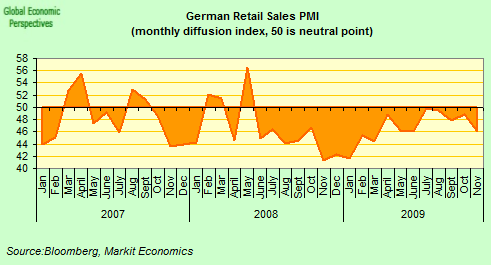 So the November data suggests that household expenditure in Germany remains relatively weak, with retailers indicating a further month-on-month reduction in sales. The seasonally adjusted Retail PMI fell from 48.8 in October to 46.0 in November, the lowest reading since June and below the neutral 50.0 mark for the eighteenth consecutive month. Anecdotal evidence from survey respondents suggests that a resistance among households to purchasing non-essential items contributed to the lower sales. The end of the scrap bonus was also commonly cited by retailers in the automobiles sector. German retailers indicated that like-for-like sales were considerably lower than one year earlier, with the rate of reduction the sharpest since March. Survey respondents commented that short working hours and weak economic conditions meant that consumersâ€™ purchasing power was much weaker than last November. If we move over now to the relevant sentiment index, we find some confirmation for this weakening, since the GFK forward looking indicator for December fell back again for the second consecutive month, and now stands at 3.7. As Gfk themselves say in their monthly report, even if experts are generally predicting an economic upswing for the coming months, consumers seem to be regarding such statements with caution, at least for the moment, and the economic expectations indicator indicator lost just under 8 points to currently stand at just 0.9 points. To put this in perspective though this is increase of 31 points over the level in November 2008. However, it is apparent that after their continuous upward trend during the past seven months, German economic expectations dropped back again in November, primarily – according to Gfk – as a result of growing public fears of rising unemployment. In the wake of this, income expectations also fell, in particular, given the fact of the reduced effect of the low energy prices, which have been fuelling purchasing power. In fact German unemployment unexpectedly fell in October, with the number of people out of work falling a seasonally adjusted 26,000 to 3.43 million. Frank-Juergen Weise, the head of the Federal Labour Agency attributed the good performance to government measures including the Kurzarbeit short-time work ones which offer incentives to hold on to staff. According to the latest comparable figures published by the Organization for Economic Cooperation and Development, Germanyâ€™s jobless rate was at 7.6 percent in September, up from a 2008 average of 7.3 percent. 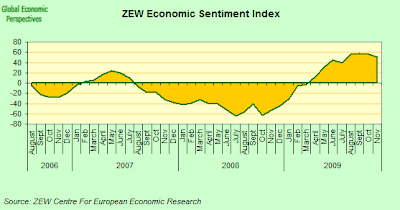 Nonetheless, in the absence of a strong recovery in global demand many German jobs are still at risk, and these are the worries which are reflected in the consumer confidence reading. The picture of a divergent economy with fairly weak domestic consumption and a rather more robust export sector is further reinforced by the flash November PMI data, which while it showed a slight improvement in the level of German economic activity over October, revealed divergent trends between manufacturing and services. According to the Markit report the recovery in service sector activity remained relatively weak, with underlying client demand subdued and new business levels falling for the first time since July. Thus while there was a fairly robust rise in new orders received by the manufacturing sector, with the rate of growth the strongest since August 2007, in the service sector, new work dropped moderately over the month as difficulties in securing new contracts continued. Job shedding remained evident in the German economy in November, with employment numbers falling for the fourteenth successive month. Reduced workforces were seen in both the manufacturing and service sectors, and it is thus not surprising to note in this context that the existing Kurtzarbeit (short time working) schemes were renewed last Wednesday, and will now remain in force until the end of 2010 (at least). Backlogs data also pointed to divergent trends between the manufacturing and service sectors. Since while the latter saw the fastest drop for four months, partly as a result of lower volumes of new work, levels of unfinished business in the manufacturing sector rose at the sharpest pace since March 2008, suggesting further pressure on firms to increase capacity utilisation at their plants. 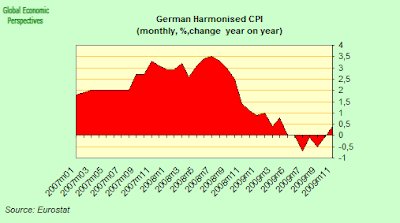 Interestingly all of this is being now reflected on the price level, since increased demand for raw materials continued to filter through to input prices in the manufacturing sector, with average purchasing costs close to stabilisation in November, and indeed the flash consumer price index for Germany . This contrasted with the record declines in costs seen in the first quarter of 2009. In the service sector, input prices rose for the second month running, contributing to a fractional increase in average costs in the private sector as a whole. Consequently, firms were less able to discount their output prices, with the latest decline the slowest since December 2008. On the other hand if we look at construction, the October construction PMI suggested there had been the sharpest decline in construction output for four months, with new orders and employment levels fell again, and the strongest rate of input cost inflation since September 2008. 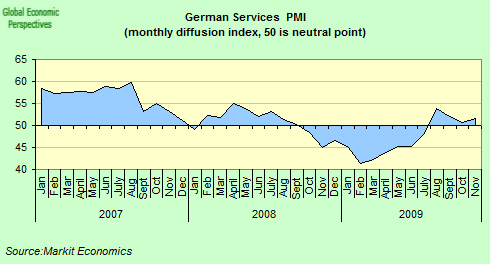 The PMI report spoke of October data pointing to “another difficult month” for the German construction sector. The headline seasonally adjusted Construction Purchasing Managersâ€™ Index registered 43.4 in October, well below the neutral 50.0 mark and the lowest reading for four months. The latest overall decline in output reflected falling activity in all three broad areas of the construction sector. Commercial activity registered the steepest reduction over the month in October. Data also pointed to the fastest drop in civil engineering activity since February and a further marked fall in housing construction. Anecdotal evidence from survey respondents suggested that weak underlying market conditions and a corresponding lack of incoming new work contributed to falling levels of construction output. Levels of new business have now dropped for twenty consecutive months. So it is hard to anticipate any positive impact on GDP from the construction sector this time round. 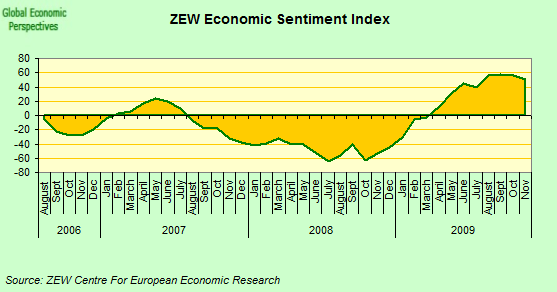 On the business sentiment front we have two divergent trends, on the one hand German analyst and investor sentiment – as measured by the ZEW index – declined by more than most observers expected in November, falling to its lowest level in four months.The drop is hardly surprising, and suggests somewhat more realistic expectations are being adopted by financial analysts on the economic outlook. In this sense earlier excesses of enthusiasm are now gradually giving way to realism. 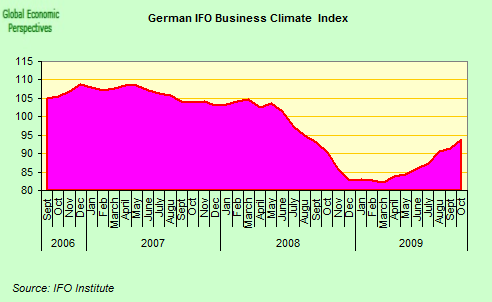 On the other hand German business confidence increased to a 15-month high in November, suggesting that many German managers expect the economic recovery to gather pace next year. The Ifo institute business climate index, based on a survey of 7,000 executives, rose to 93.9 from 92 in October, the highest reading since August last year. The index reached a 26-year low of 82.2 in March. Which means that in Q4 it is all going to be about trade. Since if German exports hold up, then the run down in inventories need not be that strong, but if exports don’t sustain momentum in December – and what just happened in Dubai is making me very nervous on that front – then German GDP will almost certainly fall back into negative territory in the fourth quarter. 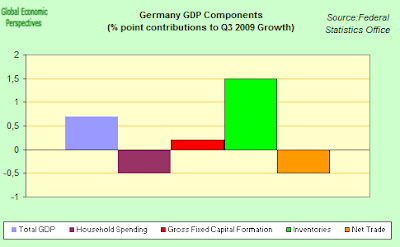 On the other hand, if I am jumping the gun slightly here, and German economic activity does manage to eke out some small increase at the end of the year, then I think a return to negative growth in the first quarter of 2010 is almost guaranteed. That is to say, we have a double dip on the horizon. At least, that is my call. Now it is over to you. This entry was posted in A Fistful Of Euros, Economics and demography, Economics: Country briefings by Edward Hugh. Bookmark the permalink. One day, somebody will give a positive outlook for Germany and I’ll get really worried. It was only a year ago that some pundits were predicting blood on the streets. 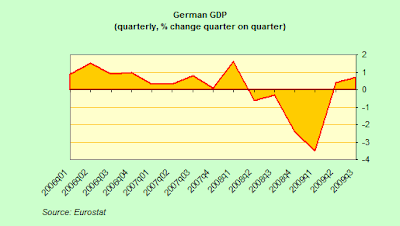 It wouldn’t really surprise if Germany bounces around the no-growth line for a while as they traded a fast recovery against a more serious decline. Engineers call it ‘dampening’ when applied to springs, I don’t know what economists call it. Pingback: FT Alphaville » Doppel-dip?